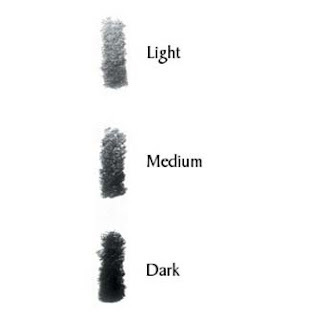 there are different types, sizes and degrees of charcoal and graphite. Know the difference before you buy your supplies. Otherwise you will be at the mercy of the art store sales clerk who, inevitably, will talk you into buying the wrong thing because the thing you need is out of stock. Vine and Willow Charcoal. Some manufacturers call it "vine" others use "willow." They are essentially the same thing. It is made by burning, or carbonizing, sticks of wood, usually willow. Pictured here is Coate's Willow Charcoal. You can see that it comes in different sizes: thin, medium, thick and extra thick. 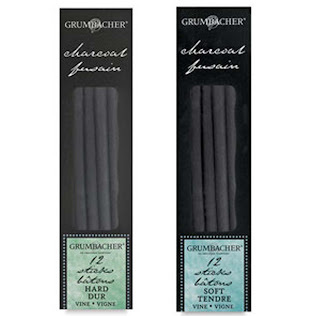 Other manufacturers like Grumbacher offer different degrees of vine charcoal: hard, medium, soft and extra soft. Hard will give you the lightest line and extra soft the darkest. 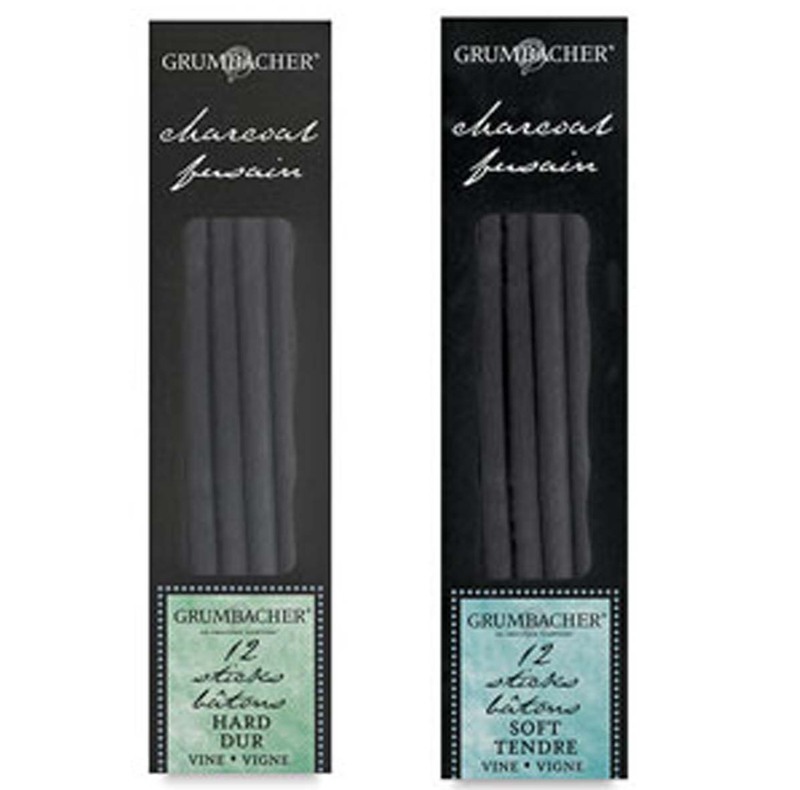 I should mention here that vine and willow charcoal break easily, especially the thinner sizes. That's okay. You'll want to break the sticks into smaller pieces when you start drawing. Just keep it off the class room floor. If you (or your instructor) step on it, it's pulverized (if I had a nickel for every time I felt that sickening crunch beneath my Clarks, I'd have $1.15). Compressed Charcoal. This is where students are often led astray in the art supply store. "It's still charcoal, right?" Not really. Compressed charcoal is not carbonized wood straight out of the oven. Actually, it is made by mixing charcoal powder with a gum binder and compressing it into stick form. Compressed charcoal gives a heavier, darker line that is harder to erase than vine and willow charcoal. Other manufacturers make extra soft, soft, medium, hard and sometimes firm. 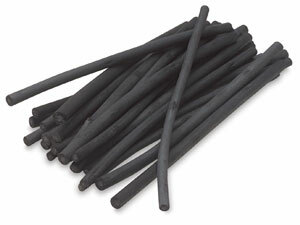 Compressed charcoal is also used in the core of charcoal pencils. If you have ever used a regular No. 2 pencil, you are already familiar with graphite. It is in the core of standard pencils and sometimes, inaccurately, referred to as "lead." Graphite pencils are, in fact, a mixture of graphite and clay in a wood casing. The amount of clay determines the degree of hardness or softness. The main thing to be aware of is the range of degrees. There are "H" pencils and "B" pencils. "H" pencils are hard and the higher the number, the lighter the line. A 6H pencil, for example, will produce a much lighter line than a 2H pencil. "B" pencils are soft and the higher the number, the darker the line or mark it will make. Generally it is the "B" pencils that are used for drawing. This chart of Staedtler Mars Lumograph pencils shows the full range of degrees. "HB" is the middle of the scale and "F" stands for either fine or firm. Other Forms. Two other forms of graphite you may find on your supply list are: woodless pencils and graphite sticks. 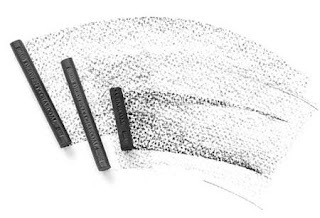 Woodless pencils (as you can guess) are graphite without the wood casing. They are made for sketching and drawing and usually on the "B" side of the scale. General's makes woodless graphite in HB, 2B, 4B, 6B and 8B. Again, different manufacturers offer different degrees. Graphite sticks are handy for large drawings and covering big areas quickly. They also come in different degrees and some manufacturers like Caran d'Ache (pictured below) make different sizes. So get your supply list as soon as you can and check it carefully. Before you go to the store know if your instructor is asking for vine charcoal or compressed charcoal or both. Pay attention to the numbers on drawing pencils. And, if something is out of stock consider ordering from an online supplier. Blick Art Materials carries everything mentioned above. You can also try Jerry's Artarama, Cheap Joe's Art Stuff and ASW to find the best prices. Graphite is a mineral, a crystalline allotropic form of carbon. In the 16th century a large deposit of graphite was discovered in Cumbria, England. Initially it was thought to be a form of lead and was called plumbago (lead ore). 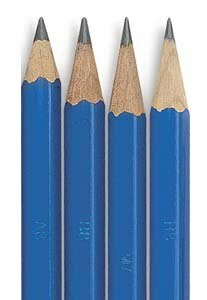 Today the graphite core of pencils is still referred to as "lead." Thank you so much for the info on the differences among charcoal types. I am surprised this was not easy info to find! Thanks for this info on the different charcoal types. I was surprised I had to search for it. You provided a nice service! This is great. I knew there was a difference, but wasn't quite sure what it was. Thank you very much for the useful information and marvelously explained!!! Thank you very much for this info. Now I know what the differences are! Very helpful, you put it in a way even inexperienced artists can understand.